Wellll, they’re here and they’re ready to go. 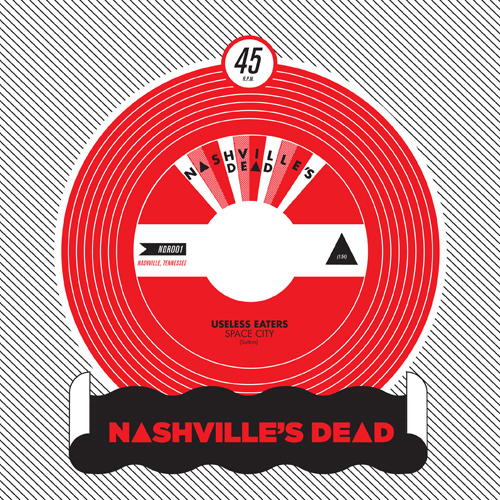 You can now order the first two Nashville’s Dead Records releases from our webstore [See it? It’s right up there!] A few lucky people were able to snag copies of the Useless Eaters single at The End on New Year’s Eve, but now everyone can get in on it. We’ve gone ahead and uploaded some samples for you in the webstore for each single so you can give your ears a little taste, and we think you’ll find them to be pretttty affordable. We’d also like to go ahead and thank our first online customer, Alberto. Alberto managed to catch us on Saturday in the 3-or-so minutes that we were testing the shop out and went ahead and placed an order. Looks like the first Nashville’s Dead record to get shipped out is going straight overseas to Italy. Pretty much all the info you need on the records is in the store, so just go and check it out. And if online shopping isn’t your thing, we’ll have them at your record store soon enough. Now you’re talking my language. that label art/design is SICK! I’ll buy it. Unable to process payment. Please contact the merchant as the shipping address provided by the merchant is invalid, and the merchant has requested that your order must be shipped to that address. I got the order placed. I changed the PO Box formatting and my zip code formatting and it went through. How did you format it that made it work? in the UK we format it like ### ### Maybe thats where my problem lies? Not sure — We’ll look into it, but it seems like most people aren’t having any problems ordering the records. Send us an email at nashvillesdeadrecords@gmail.com and we’ll get you sorted out! Hi, Thanks so much, I have just emailed the address you provided. I’m very proud to be your first on line customer! And I’ve just placed the Paperhead order, of course. I guess it’s too late now to ask for combining my two orders (to save on shipping costs), right? Anyway, good luck with the store, I’ll be a loyal supporter! We’ll try and figure that out for you. Anything for Alberto! I placed an order for both singles and didn’t have any problems processing the payment (I’m in Germany). However, I have yet to receive a confirmation mail for this order. Any info on that? Oh, and good luck with the label. Looking forward to future releases.